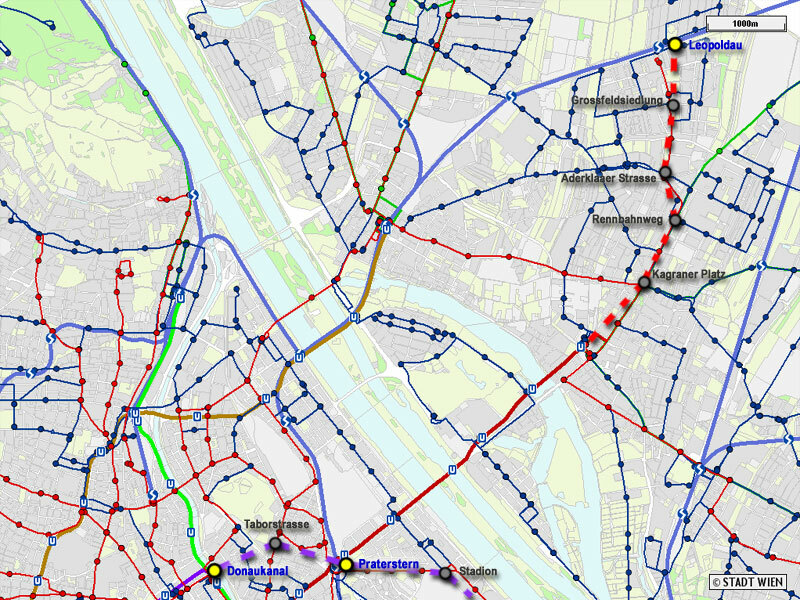 Rising population and town planning considerations made it necessary to massively extend the subway net of Vienna. The begin of the work was in 2001 and now - 2005 - the building sites everywhere in town can't be overseen. 3 of the building sites have been visited representatively for some phases of the work. The site is an excellent example for the "New Austrian Tunnel Method" (NATM). The 2 main station tunnel sections were digged after solidifying the soil under the Wienkanal River by freezing it with liquid nitrogen. If you look closely in the panoramas you can see the pipes covered with frozen water. In terms of size, the largest station. The complete station area is 2 stories high. The concrete skeletal structure is already finished. Walk around a little and see a tunnel drilling machine in action as well as some other heavy machinery. U1-Leopoldau, future terminal stop with infrastructure for the rolling stock, Station Name: "Leopoldau"
Main building work is complete. Currently the interior is finished. The virtual tour will give you the opportunity to see all main areas like the garage where the train fleet will be serviced and repaired. You can also walk into the subway tunnel. A link to a short official 3D animation (10MB) about the extension of U1 © by the Wiener Linien. A "thank you" to the Ombudsmen of the "Wiener Linien" who supported me in taking the panoramas, especially Ing. Walter Zemen from Praterstern who helped me to find the right contacts and get permission to shoot, also Ing. Kurt Großkopf for guiding me through the Schottenring site and Ing. Horvath for the access at Leopoldau.